No one is more honest and trustworthy than Scott and Ryan in an industry where many plumbing and slab leak services have inflated prices, cut corners and really don't give a fair deal. Over 75% of our business comes from repeat customers...which says a lot. We are highly respected for our knowledge of dealing with slab leaks, re-piping, and reroutes. Slab Leaks Plus Inc. maintains state of the art equipment with the latest features to provide you with the utmost professional job available. We have a team of professionals that specialize in handling all of your needs, from plumbing, water damage, and reconstruction. Give us a call and check us out. Use code name CODY to receive up to 50% off your leak detection. We believe in 100% customer satisfaction and will do whatever it takes to achieve that goal. Our philosophy at Slab Leaks Plus Inc. is to work on your home as if it were our own. We specialize in hard to find leaks and repairing them. We are a full-service plumbing and slab leak service company that can tackle any plumbing problem no matter how large or small of a job you may have! 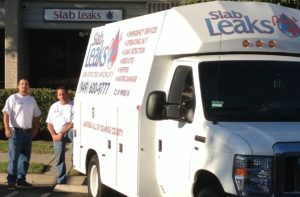 Call Slab Leaks Plus today if you need plumbing services or leak detection in Laguna Niguel, Irvine, Mission Viejo, Aliso Viejo, Ladera Ranch, Laguna Hills, Newport Beach, Lake Forest, Foothill Ranch, Newport Coast, Huntington Beach or Rancho Santa Margarita. Our highly-skilled team will provide expert slab leak detection and repair!